The first-ever commuter train service in Tanzania's commercial capital, Dar es Salaam, has been launched to ease congestion on roads. Transport Minister Harrison Mwakyembe boarded a train, along with passengers, for the maiden journey. The trains will run on two routes, mostly during peak hour. Private commuter minibuses, known as "daladalas", are the main mode of transport in Dar es Salaam, one of the world's fastest-growing cities. It is the first phase of a government scheme to improve the transport network in Dar es Salaam. The BBC's Leonald Mubali in Dar es Salaam, which has a population of about 2.5 million, says many residents have welcomed the new railway service and hope that it will be expanded. One track covers a 25km (15.5 miles) journey between Dar es Salaam's Mwakanga and Tazara railway stations and the second track runs for 20km (12.4 miles) between Ubungo-Maziwa and City railway stations. Trains will operate during the morning and evening - not in the afternoon and late at night. A one-way ticket costs 400 Tanzanian shillings (about $0.25, £0.15), which compares favourably to daladala fares which range between 500 shillings and 1,000 shillings - depending on the journey. The US Citizenship and Immigration Service recently launched the E-Verify: “Know Your Rights” Campaign for employees. The goal is to educate employees about E-Verify, Self Check, and their rights as employees so that they are able to identify a violation of their rights. As part of the campaign, USCIS has developed a toolkit for employees to obtain information, procedures, and contact information to assist them during the E-Verify process. E-Verify is an internet based system that compares information from Form I-9 with Department of Homeland Security and Social Security Administration records to confirm that an employee is authorized to work in the United States. E-Verify uses a person’s name, social security number, date of birth, and immigration information (if applicable) to match up to government records and verify employment eligibility for all new hires. E-Verify is used by many employers voluntarily, but is required for some by law. An employer who uses E-Verify is required to notify employees of their participation in the program. Self Check, a part of E-Verify, is a free internet-based application that is used by an individual to confirm their work eligibility in the U.S. Much like E-Verify, Self-Check checks an employee’s personal information against government databases to determine work eligibility. With Self-Check, U.S. Workers can access their employment eligibility status to ensure that their records are up to date as well as provide them with instructions should a problem exist. The Toolkit includes helpful video, radio, and print materials that explain E-Verify and Self Check as well as “Know your Rights” information for the employee. More specifically, the Toolkit provides frequently asked questions and instructions on completing Self Check, the E-Verify process, and an outline of employees rights, responsibilities, and contact information should discrimination occur. You may check out the Toolkit at: Employee Rights Toolkit. With more employees understanding their rights and having avenues to assert them, employers should remain vigilant during the hiring, I-9 and E-Verify processes to ensure they are in compliance with all guidance from the Office of Special Counsel for Immigration Related Discrimination (OSC). When completing Form I-9, employees may present any documents listed as acceptable on the form; Employers may not request specific or additional documents be presented. This practice is known as document abuse and it is a violation of immigration law. If an employee receives a non-confirmation from E-Verify, it is vitally important that the employer provides them with all necessary documentation to remedy the issue at the appropriate government agency. Without this documentation, the employee will be unable to correct the problem and a final non-confirmation will be issued by E-Verify, which will result in the termination of the employee. An employee has the right to contact the E-Verify hotline for assistance during this process without fear of retaliation for doing so. Retaliation can be in the form of termination, suspension, withholding of pay or training, delaying a start date, or limiting employment. As always, it is imperative that employers avoid discrimination based on national origin, citizenship, or immigration status. Should an employee feel as though they were discriminated against, they have the right to contact the Office of Special Counsel (OSC) and report the incident. Once the OSC is contacted, they will open an investigation into the matter and resolve it as deemed appropriate. Resolution could include fines and penalties for the employer. Former President Bill Clinton and Vice President Joe Biden hold a grassroots rally with supporters in Youngstown, Ohio. President Clinton will spell out the economic issues at stake in next week's presidential election. President Obama was previously scheduled to travel with Bill Clinton to Youngstown following an earlier event in Orlando, Florida. Instead, the President is returning to the White House to monitor Hurricane Sandy and all his campaign events scheduled for Monday have been canceled. Prime Minister Raila Odinga has gone flat out for the Rift Valley vote with a strategy tailored to bring Eldoret North MP William Ruto to his side through grassroots mobilisation. It also emerged a section of the Kalenjin leadership now prefers working with him under a new negotiated arrangement that they believe would accommodate Ruto and protect the community’s interest better. “The bottom-line of our talks is we told Raila to go and negotiate with Ruto and if he does not accept, he comes back to us and we shall decide the next step,’’ said a minister who is at the centre of the talks, speaking on condition of anonymity as he fears public statements on the matter could botch the negotiations now at a sensitive stage. During a meeting with Kalenjin elders at a private home in Ngata, Nakuru, yesterday, Raila humbly sought forgiveness from the community which overwhelmingly supported him in 2007, and which Ruto is now goading towards Mr Uhuru Kenyatta’s The National Alliance. He particularly responded to claims he was the force behind the Mau Forest evictions. Raila’s apology is considered the first crucial step in confronting perception among Ruto’s supporters that he is ungrateful and dictatorial, and is meant to soften the region where Ruto calls the shots for his comeback. Yesterday, Ruto met Kalenjin elders and leaders drawn from Transmara, Narok, Bomet, Kericho, Nakuru and Baringo. Next week, a source familiar with the ongoing behind-the-scenes talks, Raila will be in Eldoret, which is Ruto’s home turf, to meet representatives of the communities living in Nandi, Uasin Gishu, Keiyo/Marakwet, Trans Nzoia and Mount Elgon. ‘We have told (Raila) why we prefer working with him now that we know Ruto is not running for President but is preparing the ground for someone else,’’ said another source familiar with the unfolding political scenario in the expansive Rift Valley Province. Ruto would not be drawn into commenting on the reported discussions and sought to be excused when The Standard reached out to him over the meeting taking place at Pilgrim Acres Hotel, Nakuru. “Please don’t get me involved in those things, that is for the organisers to comment,” Ruto said in telephone interview. The leaders were specific, they wanted Raila to sustain talks with Ruto, and appeared to insinuate that if he did not change heart, they may either decide to confront him or mobilise the ordinary folk in the region to Raila’s side as happened in 2007 when initially Ruto preferred working with Mr Kalonzo Musyoka. Describing the pact as a “formidable” one, the Kalenjin elders beseeched the PM to meet Ruto and iron out any issues they might have and forge an alliance ahead of March’s elections. Raila Odinga who was accompanied by three ministers — Mr James Orengo, Paul Otuoma and Musa Sirma — and two Assistant ministers Magerer Lang’at and Beatrice Kones, as well as Kapenguria MP Wilson Litole was emphatic in his apology. “Forgive me, I am seeking forgiveness. If I erred, I am sorry I am a human being and apologise as we were in the same team last time,” Raila said in a subdued voice as he looked at the elders before him. He reiterated the talks between him and Ruto were still on track. He gave a strong indication that formation of an alliance between him and the Eldoret North MP was still in the works when he revealed he was waiting for Ruto to respond to the proposal he gave him for a pre-election coalition. “We talked with Ruto and we are still talking and the ball is now in his court. I am ready and willing to engage him in further talks,” Raila told the elders drawn from six counties within Rift Valley. Raila told the elders he was the same ‘Arap Mibei’ (the name given him by the community in 2007) and said he had been wrongly blamed for some of the problems the people had faced. “I have not changed and am the same Arap Mibei and I am ready to carry the flag you gave me to State House so that we can finish the journey we started last time,” the ODM leader assured the congregation. During the daylong meeting, Raila absolved himself from blame over the issues raised by the some Rift MPs led by Ruto when they to abandoned ODM. Pilgrim Acres Hotel is associated with former NCIC Commissioner Lawrence Bomet who is seeking the Nakuru Governor seat. He also attended the meeting. Raila reiterated he had no role to play in the eviction of families from Mau forest saying it was a Cabinet decision, which was implemented following recommendation from a Task Force formed on how to reclaim the water tower. “Most of the Kalenjin like you and want you to talk to Ruto. When both of you agree, we are going to be very happy as we believe it is a winning combination,” Councillor Joshua Cheruiyot told Raila. Raila argued some of the issues that drove a wedge between him and Rift valley leaders could be attributed to the sharing of power between ODM and PNU where the Orange party was short-changed. Raila said: “All the powerful positions went to the other side (PNU) and we had to share the leftovers. What we got was like removing meat from the jaws of a lion. Unfortunately our people started grumbling over the way the positions had been shared between various regions which supported ODM,” he went on. “We were scoring in the same goal and were robbed of our victory. I have been wondering (why) some of the people who were our team members have decided to play for our opponents,” Raila lamented. On the ICC issue the PM outlined to the elders the chronology of events that led to the six Kenyans being arraigned at the International Criminal Court. Raila also addressed the issue of youths who were allegedly arrested after the post-election violence saying all those arrested in connection with the violence were later released after he sought Cabinet’s intervention. “All those who were arrested including Kibor (Jackson) were released and I personally travelled from Nairobi to Nakuru after he was arrested,” Raila added. Speakers at the meeting however told the PM that he should address some of the issues affecting Nakuru County including land problems and skewed resettlement of the internally displaced if he expected to get their support. Raila criticised a plot by some leaders to ensure all the seats in Nakuru County go to one community. Led by Mr Pius Langat who is the United Republican Party secretary general in Nakuru County, the Nakuru elders listed land injustices as their biggest worry. “How could the government purchase parcels of land, build schools, hospitals and shopping centres for a single community while others who suffered the same fate are left out?” questioned Langat. Unless such injustices are corrected, other speakers insisted that the community was ready for to rebel against any URP decision to work with TNA. “This is the time people from the Kalenjin community weigh properly their next political direction and who they should support for the presidency”, advised Ms Alice Kering. Former East Pokot MP Stephen Cheptai who said he was among those who called Raila to the meeting argued the region was not yet ready to work with a presidential candidate from Mount Kenya region and urged Ruto to change his mind. It's inevitable that I should write a post like this, if for no other reason than to give y'all a chance to sound off about it on the thread. In truth, none of us has any idea how this plays. I will note that it appears that only two states that are in play are likely to be directly affected in a big way--Virginia and New Hampshire. And Virginia, from the tracking I've seen, isn't really in the main path, which appears to be mostly to the Northeast. That leaves the Granite State. Expect to see a disproprotionate amount of disaster footage from Hampton Beach on Fox over the next couple of days ("New Hampshire has just been pummelled, and some are saying that the president just doesn't seem to care that much..."). If the storm proves to be just overwhelming, obviously it can generate some negative press for the admininstration; it may be so devastating that no amount of preparation could stop many billions of dollars' worth of damage from happening. On the other hand, all a president usually has to do is seem to be on top of the sitch and caring about what happens. Bush messed up Katrina not because he didn't care about New Orleans or its black people, but because he just never paid much attention to facts and evidence, in Iraq or New Orleans or anywhere. Obama, fortunately, is an empiricist, so I think we can assume he's paying attention and directing the appropriate agencies to do appropriate things. "The pretty strong pattern turns out to be that all other things being equal, the incumbent party does less well when it's too wet or too dry," says Larry Bartels, a professor of political science at Vanderbilt University. In 2004, Bartels and his then-colleague Christopher H. Achen, who's now a professor at Princeton, authored a study on the impact of climate on elections. According to their study, Al Gore lost an estimated 2.8 million votes to George W. Bush in certain states because of drought or excessive rain. On the other side of the ledger, we do have Romney on record as saying privatize FEMA. He did not quite say that FEMA was "immoral," as some are writing. He said the debt to future generations caused by government spending on projects such as FEMA is immoral. But that's not a defense. I think his statement itself was close to immoral. As The National Memo asks this morning, if disaster relief isn't providing for the general welfare, then what is? Privatization of this service seems particularly dubious to me. I can see privatization of garbage collection, say--a firm can make money from it. But who can make a profit from disaster relief? Maintaining levees and breach walls seems like a pretty expensive undertaking. Then what happens when disaster strikes--households are going to be charged a couple thousand bucks for the work performed? And of course, they'd be charged even if their homes were destroyed, or companies would try to, because the company's expenses would still have occurred. It's a daft, dishonest, stupid, totally non-sensical idea, which is to say, for Mitt Romney, about par for the course. President Obama makes a statement after a briefing on Hurricane Sandy at FEMA Headquarters on October 28, 2012 in Washington, D.C.
Photo by Dennis Brack-Pool/Getty Images. Hurricane Sandy has yet to make landfall in the United States, but it's already impacting next week's election. For starters, it has forced President Obama and Mitt Romney to rework their carefully planned campaign schedules, and election officials in Maryland and the District of Columbia to temporarily suspend early voting. While it's obviously too early to say for certain just how much the storm could impact early voting between the East Coast and the Great Lakes, it doesn't exactly take a giant leap to imagine a scenario where the answer to that question is somewhere between "some" and "a whole lot." If nothing else, the storm is providing one final unscripted moment for a campaign that appeared to be largely in auto-drive heading into the final week. Are election outcomes driven by events beyond the control of politicians? Democratic accountability requires that voters make reasonable evaluations of incumbents. Although natural disasters are beyond human control, the response to these events is the responsibility of elected officials. In a county-level analysis of gubernatorial and presidential elections from 1970 to 2006, we examine the effects of weather events and governmental responses. We find that electorates punish presidents and governors for severe weather damage. However, we find that these effects are dwarfed by the response of attentive electorates to the actions of their officials. When the president rejects a request by the governor for federal assistance, the president is punished and the governor is rewarded at the polls. The electorate is able to separate random events from governmental responses and attribute actions based on the defined roles of these two politicians. "[P]residents are punished for severe weather damage. For example, $20,000 in weather damage in a county of 10,000 voters would result in a modest decrease of a quarter point in the two-party popular vote. This finding also holds even when accounting for a federal response to weather damage. In all specifications of the model we find evidence supporting a responsive electorate and our retrospection of outcomes hypothesis. Even though electorates reward politicians for taking action, they also punish the incumbent for so-called acts of God. The model also shows that presidents receive an electoral boost for disaster declarations, but one that is substantially smaller than the one received by the governor." You can read the full thing here. Keep in mind that among those states expected to be hit by the Frankenstorm are a quartet of battleground states currently considered to be toss-ups by Real Clear Politics: North Carolina, Virginia, Pennsylvania, and New Hampshire. 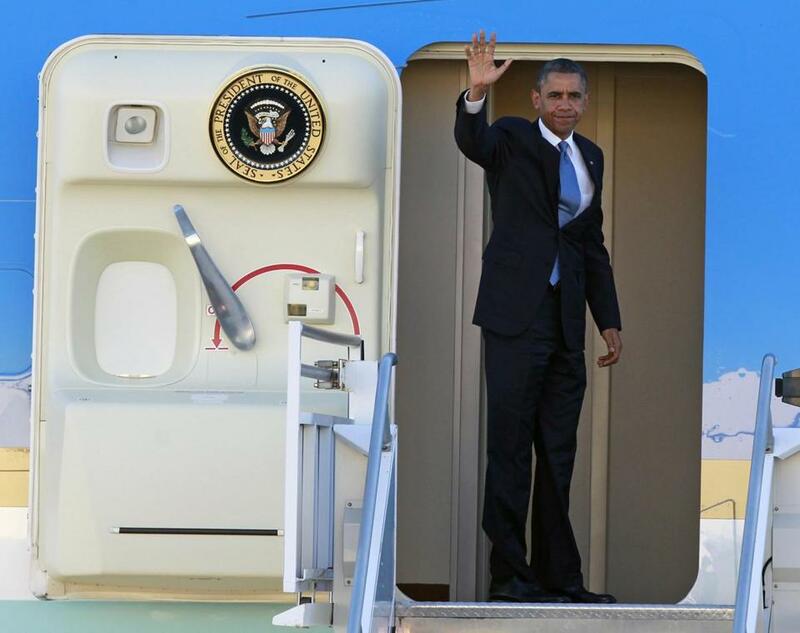 President Obama waves today as he boards Air Force One before departing from Orlando International Airport to return to Washington to oversee his administration’s response to Hurricane Sandy. From a political perspective, Hurricane Sandy is coming ashore as a wash. It freezes an essentially tied presidential race. And while it gave President Obama a chance to show his abilities as commander in chief just as voters are deciding whether to give him a second term, it also gave Mitt Romney an unfettered opportunity to campaign in swing states that have been vital to his surge in recent weeks - before appearing magnanimous by announcing he was curtailing his efforts tonight and Tuesday in an expression of national unity. The true test comes in the storm’s aftermath. That helps explain why the president turned around this morning from a planned campaign appearance in Orlando and hightailed it out of the battleground state of Florida to get back to the White House to oversee his administration’s response. Many of the debates in a political campaign can seem detached from the average person’s daily life, arguments over a $16 trillion national debt or tax hikes for people making over $250,000 far removed from the demands of ferrying kids to soccer games or angling for a promotion at work. But when the lights go out, when the house gets cold, and when the pace of recovery stretches inordinately long, people look for someone to blame - and that someone collectively moves from their local selectman on up to the president of the United States. On Sunday, Obama sought to convey his engagement by visiting FEMA headquarters in Washington. He repeated it again today during a late-morning appearance in the White House Briefing Room. “The good news is, is that the governors and local officials, I think, have had a few days of preparation. There’s been extraordinarily close coordination between state, federal, and local governments. And so we’re confident that the assets are pre-positioned for an effective response in the aftermath of the storm,” the president said. On Sunday, the president made what seems, in retrospect, an ill-considered decision to proceed to Florida for a planned appearance with former President Bill Clinton in a state where Romney has opened up a lead. This morning, he reconsidered and returned back to Washington. Conditions had already gotten so bad that the pilots aboard the charter plane scheduled to return the Obama press corps back to Joint Base Andrews in Maryland decided against trailing Air Force One. The president had previously skipped out of campaign stops with Clinton scheduled for later in the day in Ohio, asking Vice President Joe Biden to step in his place to avoid cancelling rallies in a pivotal electoral state. “The president continues to receive regular updates on the storm, and continues to direct his team to make sure all available resources are brought to bear to support state and local partners,” White House Press Secretary Jay Carney said in a statement Sunday night announcing the changes. Romney, meanwhile, cancelled planned stops in Virginia on Sunday, forged ahead with scheduled stops today safely away from the storm in Ohio, Iowa, and Wisconsin, but switched out a planned visit to Milford, N.H., on Tuesday to instead campaign in Ohio and Iowa. This morning, his campaign staff changed plans again, announcing he would halt campaigning tonight and stay off the trail tomorrow. “Governor Romney believes this is a time for the nation and its leaders to come together to focus on those Americans who are in harm’s way,” campaign Communications Director Gail Gitcho said in a statement. The storm has the potential to be a momentum-breaker for Romney’s campaign, since it will consume a huge swath of media bandwith just as he is making his closing argument to voters. But he also stands to benefit from conveying empathy to the victims as well as any misstep made by Obama. His campaign announced that in North Carolina, New Hampshire, Pennsylvania, and Virginia, it was collecting storm-relief supplies. “In Virginia, we are loading storm-relief supplies onto the Romney bus to be delivered,” a statement said. Ann Romney was redeployed to Michigan, her homestate and another key presidential battleground. The Romney campaign also halted fund-raising e-mails in states affected by the hurricane, and the Romneys sent an e-mail encouraging donations to the Red Cross. “For safety’s sake, as you and your family prepare for the storm, please be sure to bring any yard signs inside. In high winds they can be dangerous, and cause damage to homes and property,” their joint statement added. On the local level, Governor Deval Patrick has been aggressive since late last week about convening conference calls and delivering media briefings, both in the formality of the State House press conference room and at the Massachusetts Emergency Management Agency bunker in Framingham. After being forced to respond to the Annie Dookhan drug testing case and the New England Compounding Center meningitis case, the governor has been proactive in the face of the storm. He not only declared a state of emergency on Saturday, more than two days before Hurricane Sandy’s full fury was expected, but he also preemptively requested a federal disaster declaration from the president, a personal friend. On Sunday, Obama granted one to Massachusetts and all the other states in the storm’s path. The candidates in the hotly contested Massachusetts US Senate race face the same freeze as their presidential counterparts, with a couple unique factors. Senator Scott Brown and his Democratic challenger, Elizabeth Warren, are set to hold their fourth and final debate in Boston on Tuesday - just at the storm’s projected peak. Whether the organizers - including The Boston Globe - will forge ahead is one open question, as is whether the TV stations participating in the sponsoring media consortium will turn away from storm coverage for a debate from 7 p.m. to 8 p.m. on Tuesday. Recent polls have shown Brown trailing in the race, making a final debate, before a potentially large television audience, important for him. He quipped Sunday about being willing to drive Warren to the TV studio in his famed green pickup truck. If you believe the polls, Warren could benefit from skipping the debate and avoiding any potential gaffe that could emanate from it, but she was the candidate who clamored for even more debates with Brown earlier this year. “It’s premature to speculate on the debate. Obviously the first priority needs to be public safety,” a spokesman said when the issue first cropped up last Thursday. Brown has tried to convey engagement on an issue more typically assigned to the state’s executive branch, personally writing to the heads of the state utilities last Thursday and asking to see copies of their storm-response plans. Patrick had already been slated to receive them on Friday. On Sunday during a campaign stop in Lowell, Brown said he and his wife, Gail Huff, were stopping on the way back to their home in Wrentham to stock up on storm supplies. This morning, the couple sent out an e-mail, urging recipients to check on the well-being of their neighbors. The senator also sent out a message via Twitter: “Please stay safe today,” he said, before adding a link to a website offering the state’s emergency information smartphone application. The senator also visited the MEMA bunker for a personal storm briefing. One potential wrinkle or opportunity for Brown? Elements of the Maryland National Guard, to which he transferred earlier this year from Massachusetts, have been activated to help with storm-relief efforts in the mid-Atlantic states. So far, Brown - a colonel and judge advocate general assigned to the Pentagon - has not been among the 250 Guard soldiers and airmen called to active duty. Were he to be, admittedly unlikely right now, it would force him to leave the campaign trail. But it would also put him in his uniform, and allow him to reprise the act he said first inspired him to join the service. That was the example of the Massachusetts National Guard helping stranded motorists and residents after another natural disaster, the Blizzard of ’78. FLOTUS Obama on "ZOE'S HEART"